The second half of the session which began on March 5 has been a washout with no legislative business being transacted due to stalling of proceedings by the opposition. New Delhi: The Rajya Sabha was adjourned for the day for the 21st straight day today without transacting any business, as it saw the Congress and the BJP accusing each other of blocking the passage of an anti-graft amendment bill and the Chair warning members protesting in the Well of suspension. Today was the penultimate day of the Budget Session of Parliament. 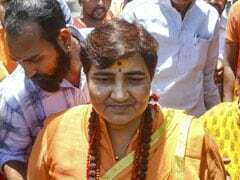 The second half of the session which began on March 5 has been a washout with no legislative business being transacted due to stalling of proceedings by the opposition. When the Upper House assembled in the morning, Opposition parties stalled proceedings, forcing the adjournment of proceedings till 2 PM. It was adjourned again for 15 minutes when it reassembled due to the stormy protests and thereafter for the day without transacting any legislative business. In the morning, trouble broke out as soon as two new members -- Vemireddy Prabhakar Reddy (YSR Congress) elected from Andhra Pradesh and Syed Nasir Hussain (Congress)from Karnataka, took oath. As listed papers were laid, Sukhendu Sekhar Roy (TMC) raised a point of order on a statement by Deputy Chairman P J Kurien in the House yesterday on the passage of Prevention of Corruption (Amendment) Bill 2013 by the Lok Sabha. He said the Bill has not been passed by Lok Sabha as was stated, while its introduction was allowed in the Rajya Sabha. Mr Naidu then corrected the record to state it was not passed and the introduction was done after incorporating the suggestions made by the Select Committee of Parliament. The Chairman could barely finish his statement when opposition members were in the Well shouting slogans. SP members, donning the party's trademark red caps, raised the issue of farmer distress. Noting that just one day was left of the session, Mr Naidu adjourned the proceedings till 2 PM. When the House re-assembled, the opposition members again came into the Well raising loud slogans, thwarting any attempt of government to get the anti-corruption bill passed. Deputy Chairman PJ Kurien, who was in the Chair, said yesterday he had allowed moving of the statutory motion which was now being put before the House. The motion sought to increase the basic customs duty on circuit boards from nil to 10 per cent. Amid unabated slogan shoutings by the opposition members who refused to budge, an agitated deputy chairman said "I am very sorry that even Chair is not allowed to speak". He said the Prevention of Corruption Act, 1988 was moved yesterday for consideration by voice vote and a division was sought for amendments, for which the House should be in order. He also said the Chairman has today corrected an "inadvertent comment" on my side which could be either a slip of tongue or inappropriate remark, while referring to the correction made in the records. "Now I have to proceed with the Bill. The issue before me is allowing division," Kurien said and urged the opposition to "vote it out" if they had any issue against the bill, but allow the House to proceed. He urged the members to leave the Well and return to their seats to allow the division, saying thier conduct was "undemocratic" and "unfair". When the protestors refused to pay heed, Kurien reiterated that it was unbecoming of the MPs and they should not behave like like this. He then adjourned the House for 15 minutes. 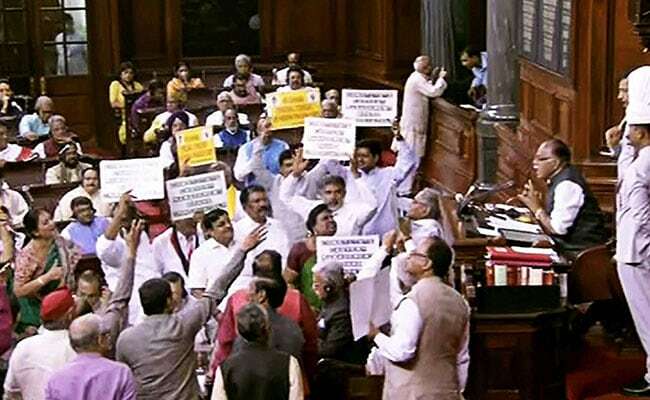 As soon as the Rajya Sabha reconvened at 2:26 pm, members from the TDP stormed the Well carrying placards demanding special status for Andhra Pradesh, while AIADMK members demanded setting up of a Cauvery management board. As a warning, Kurien then read out the provisions of House Rule 256 and said all those protesting in the Well and obstructing normal business were all liable and eligible to be suspended. "Rule 256 says that you all can be suspended on a motion made here should I resort to that? Should I proceed with that," Kurien said, while repeately urging the members to allow voting and division to get the anti-corruption bill passed. "If you do not allow to take a vote on division itself, how democratic is it," Kurien asked the protesting members. Minister of State in the PMO Jitendra Singh said in the last four years the anti-corruption legislation has been to the Standing committee and the Select Committee and has been thoroughly discussed and studied by members across party lines. "It (the passage of thre Bill) is not only the sense of the House Sir, it is the sense of the nation," Singh told Kurien. He said the government's "crusade against corruption" has been disrupted by some members who do not wish to proceed against corruption and do not want any initiative against corruption to materialise. "This also reflects the duplicity of the members who outside the House demand stringent measures against corruption but when the government moves forward in its resolve of zero tolerance towards corruption, they tend to disrupt the House to ensure that there is no legislation which curbs corruption in the times to come," Singh said. Kurien then said he had two alternatives -- "as per rule, I have to go for division. My humble appeal to you is, please allow and if you vote against it, that is democracy. Otherwise if you don't allow that I will have to see that a motion is moved to expel all these members in the Well. "There is rule by which a motion can be moved and you all can be expelled. Thereby you will lose all your voting right," Kurien said. Deputy Leader of Opposition Anand Sharma defended the Opposition, saying "nobody in the Opposition is saying that there should not be any change in the law or no legislation. "It is a false accusation that has been made by the minister just now and the words should be expunged. There is already a law against corruption. They are saying that we are against it. What has been said, we object to that. It cannot be allowed to stay on record," Sharma said. Parliamentary Affairs Minister Vijay Goel got up and alleged that the Congress did not let the House run for 21 days on the pretext of various excuses while the government is ready to hold discussion on anti-graft or any other bill. However, Sharma countered him and said the government does not want these matters to be resolved and its corruption to be exposed. As the hearted exchanges continued and the noisy protests went on unabated, the Deputy Chairman adjourned the House for the day.